I was in group A, which consisted of Mayah (Call it Vanity) Sarah (Sugarpuffish) Rachel (All Natural Aspirations) Jen (Jen’s green skincare) Tania (Bow Tied Beauty) Katie (What Katie Rates) and Hephzibah (Good For Me, Good For You) and myself. We first met up at Marylebone station, before walking our way to our first stop, Content Beauty/Wellbeing. 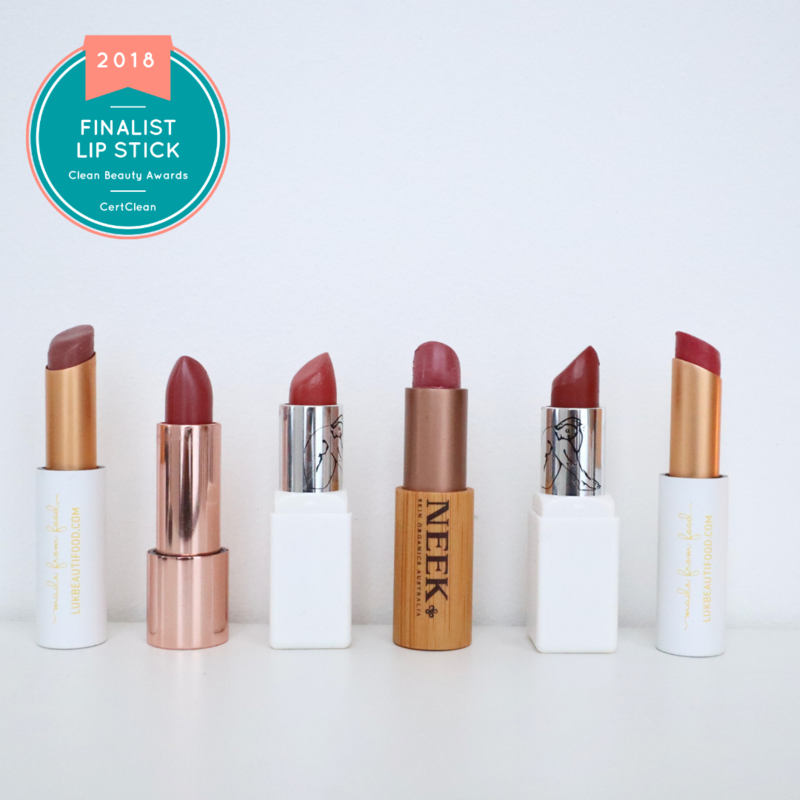 There’s simply everything a beauty enthusiast could possibly dream of. If you go to London, it’s a must! I made my first green order on Content’s online shop (is it weird that I remember that?) so you can imagine my excitement. Don’t be fooled by the small size of the boutique, because they have everything you need (and even more). We were greeted by the lovely founder Imelda Burke and her staff, and I got so giddy to be able to see the shop in real life. Everyone was super friendly, it smelled incredible in here – a sort of herbal and essential oil mix. 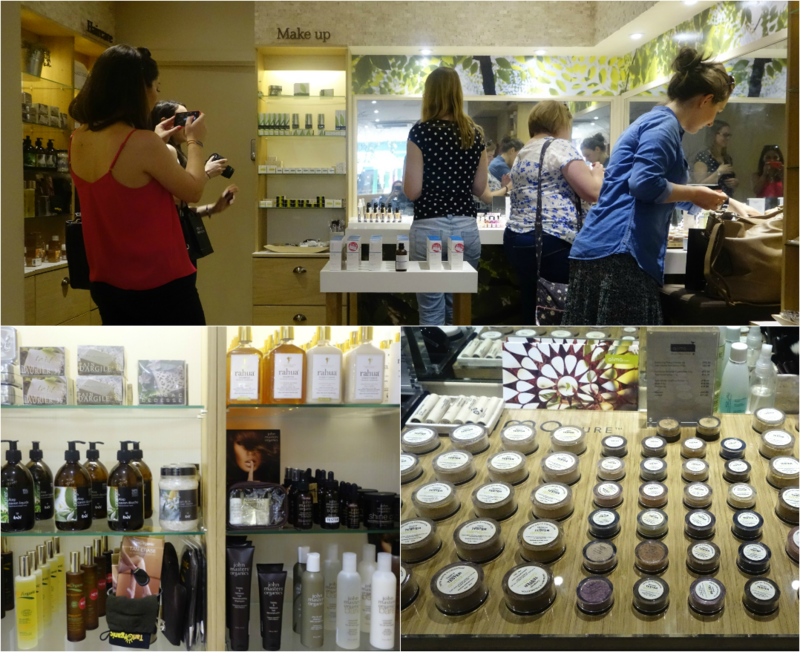 We stayed there for an hour, but you can easily lose yourself in the aromas and sweet beauty products for hours. 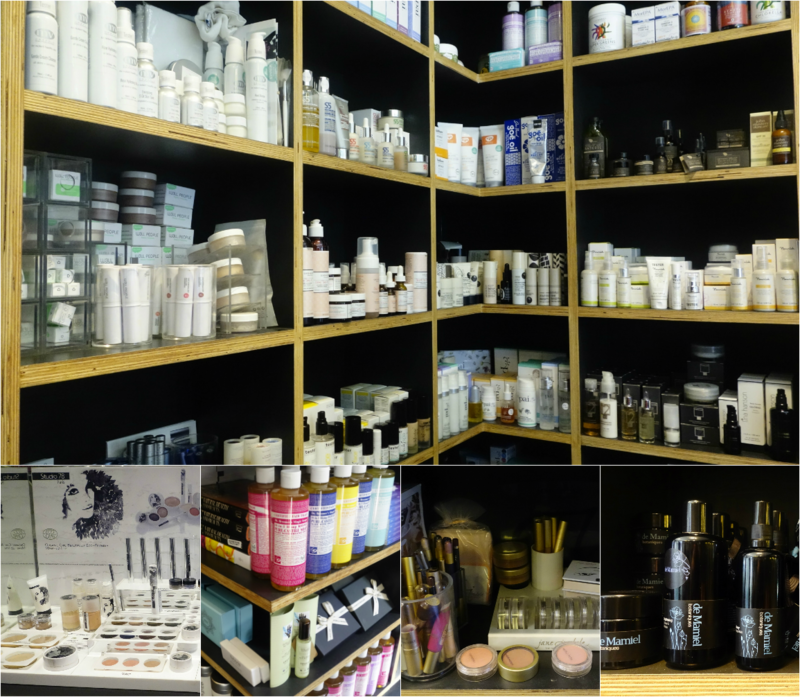 You can already see the green brands Content has online, but it’s remarkable how everything fits in one room: everything is neatly organized into shelves, there are testers for every product, so you can sniff and swatch all you want. 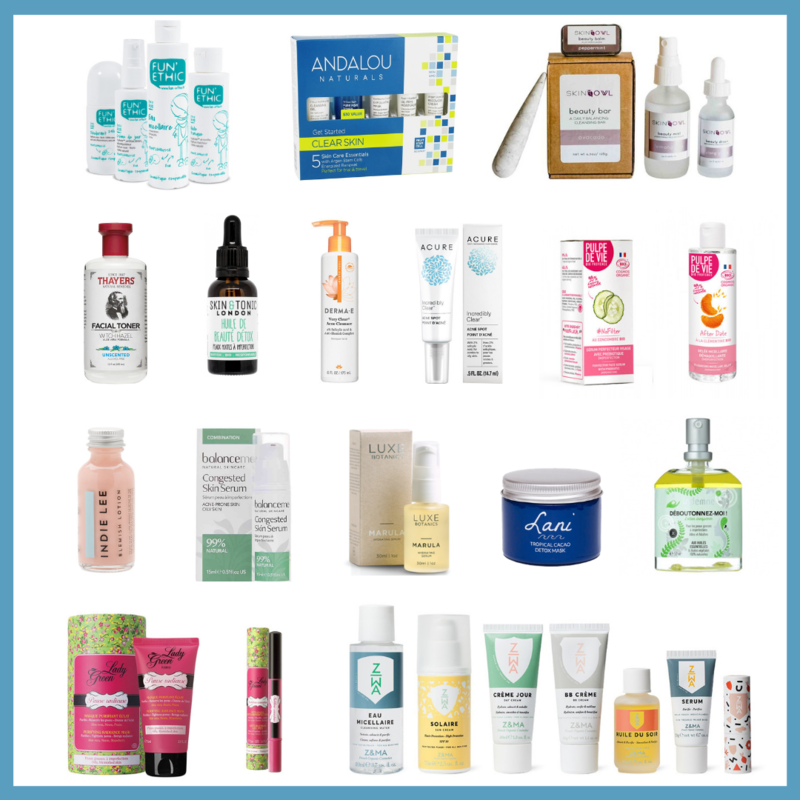 *Holds breath* You can spot some W3ll People, One Love Organics, Pai Skincare, De Mamiel, Aurelia, Nourish, Jane Iredale, Dr. Bronners, Studio 75 Paris, Vapour, Suki, Absolution, Dr Jackson, MV Skincare, S5, Live Nature, Lina Hanson, John Master’s organics…and this is not even half of what Content stores inside. Last set of pictures – my favorite haha – is color galore! I have swatched foundations, concealers, cream shadows, and most importantly lipsticks. Now I’m even more confused about picking only one shade, as they are all gorgeous. On my hand, there’s a mixture of RMS and Ilia. On top, RMS’ diabolique, modest, sacred, sublime, and on the right you can also see Ilia’s new lip gloss “Back to life” a stunning orchid shade, along with Karma Chameleon and Dress you up. I almost bought W3ll People’s Narcissist stick Foundation + Concealer. After swatching all the shades, n°3 turned out to be a great match, but I want to use up my RMS concealer first. At least I know which shade to get now. 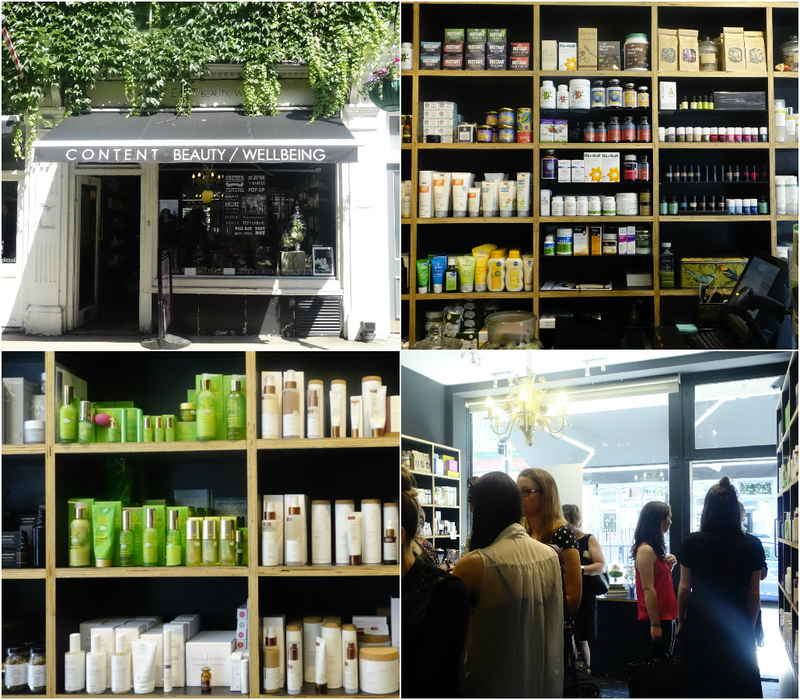 Once arriving at Kensington, we walked past Space NK and Neal’s Yard Remedies before entering Nature & Co. I would describe it as a haven of peace and quiet. We were welcomed with open arms and some refreshments, which were definitely needed as the weather was quite warm. This is only a small part of Nature & Co’! Nature & Co’s atmosphere was really zen, and the shop was more spacious than Content. It’s divided in two floors, one being used for spa treatments. Now Content also has an area for facials and treatments, but we only stayed inside the shop of course. 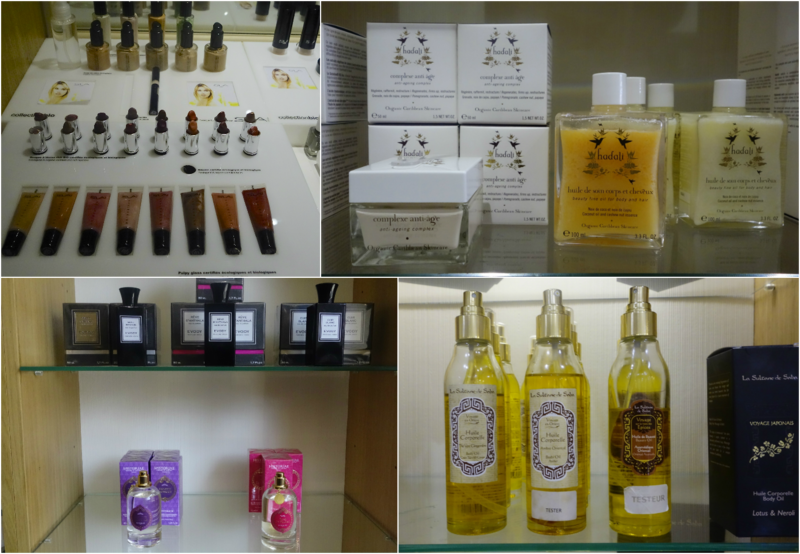 While I didn’t make any purchases, Nature & Co particularly caught my attention for showcasing some brands that were new to me : SLA, Hadali, Rêve d’Anthala and La Sultane de Saba are now on my radar. As you can see on the picture above, SLA (short for Serge Louis Alvarez) is an organic makeup range. Nature & Co has a selection of their liquid foundations and lip products. I swatched a few lipsticks and I really like their shimmery/metallic effect. Hadali is an organic brand from the Caribbean selling skin and body products, their body oils contained lush ingredients such as Coconut and Cashew oils. Rêve d’Anthala is a perfume brand and I particularly liked the one named “Evody” which has a sweet aroma. La Sultane de Saba has some enticing body oils and body butters with an oriental vibe, using ingredients such as argan, rose or orange blossom. I’ll definitely have a closer look at these brands. Top picture: Testing, filming, taking pictures aka. 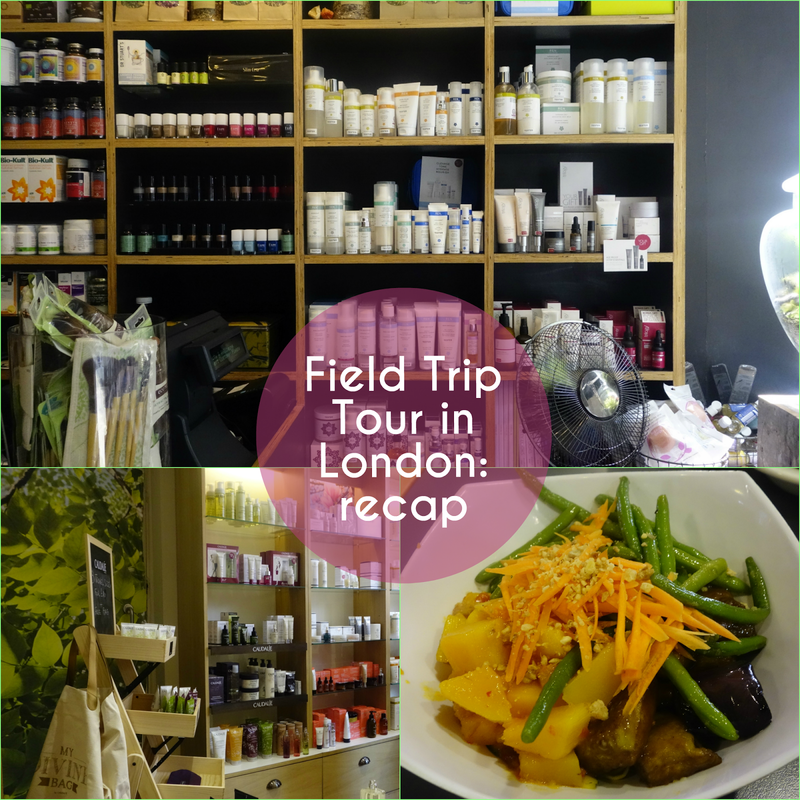 bloggers in action/ Bottom pictures: Tanorganics, Rahua, John Masters organics and Alima Pure. Nature & Co uses the products sold in their shop for their spa treatments, so I can only imagine how amazing their treatments must be. 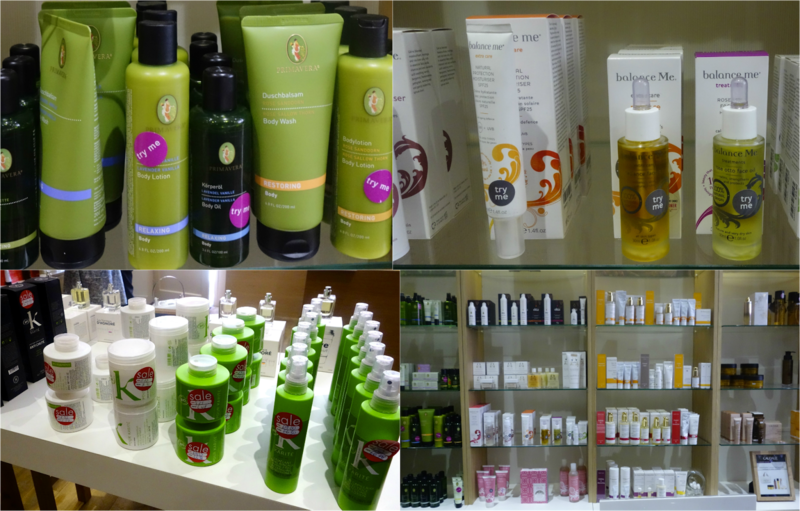 I was really happy to see a counter of Alima Pure, as it’s quite difficult to find their products in Europe. Nature & Co will also launch an online store soon so that’s very exciting, because they stock some really nice niche brands. After a lovely hour spent in the shop, we headed to Whole Foods, which was a few minutes away by walk. It was my first time in an actual Whole Foods and I know what I’m missing now! Three floors, 80,000 square feet of natural goodness! When we got to the restaurant, the lovely girls from the group B were already sat and finishing up their meals. We only managed to catch a glimpse of them at lunch, but I still got to hug everyone, so all is well 🙂 I don’t usually take food pictures, but I had to whip my camera out to snap a pic of my lunch (see the very first picture set). The noodles were buried under the massive bowl of veggies, and it was so filling that I wasn’t able to finish it. Now the goodies! I don’t dare call it a haul, as I was quite reasonable, and only got two items. It’s mostly due to the fact that I had to leave earlier. Had I spent more time at Whole Foods, it would have been a completely different picture haha. My purchases are on top of the picture : W3ll People’s expressionist mascara, I opted for this one instead of RMS or Kjaer Weis, because the oval shape of the wand looks intriguing, and so far the reviews were very positive. It’s also my first W3ll People purchase. Content has in front of the cash register, a huge bowl filed with Hurraw balms and I couldn’t help grab one of their new ayurvedic balms. I got Pitta (coconut-mint) and it tastes amazing. The bottom part is what Content Beauty generously offered. Needless to say, I was blown away by their huge kindness. Lots of high-end green products: a sample of Abel’s fragrance, Vapour’s Illusionist concealer, a travel size bottle of Rahua’s conditioner, Suki’s balancing day lotion for combination/oily skin, Tata Harper’s floral water, a sample of Twelve’s Essential Biotechnological moisturiser, and last but certainly not least, an unexpiring discount code for our next Content purchase – valid both online and in store. How freaking awesome is that?! Short but sweet, my first trip to London and was an absolute blast! Kudos to Mayah and Sabrina for planning this fantastic day! Everything ran super smoothly and it was just top-notch. If you are not following Call it Vanity, please check out their blog (here), otherwise you’re missing out big times. Mayah, you have been more than amazing, so thank you so much! I gotta say you have some superhero skillz, because juggling the organisation, directions to each place, filming, taking pictures, and doing all of that while being the sweetest tour guide is mindblowing. I did not break the bank (my wallet is sighing with relief), but I got to meet the wonderful girls that were part of this trip – wish I got to chat a bit longer with the group B – and that was the highlight! It was amazing to see everyone in the flesh. I feel blessed and I’m so grateful for this kind and fun green community. Until the next blogger meet up, see you online! From blogs to shops! Online boutiques curated by green bloggers! In my dream, i have a whole foods close to my home. Unfortunatly, the closer whole foods is at Toronto (like 6 hour car of my home). In Montréal, we have nothing like that. Nothing. No luxury natural beauty boutique. Sad. thanks for sharing this is a beautiful event ! Great idea! You made a great choice as I LOVE the W3LL People mascara so much!!! I wish I could have been on that field trip with you all so much!! Looks great! Really want to try that w3ll people mascara! This looks like heaven! I wish that I could visit that lovely shop! You are actually the sweetest Liz! It was such a pleasure to spend the day with you and so honoured you made it all the way over form Luxembourg/Brussel to come to our little event 🙂 Already looking forward to the next time!